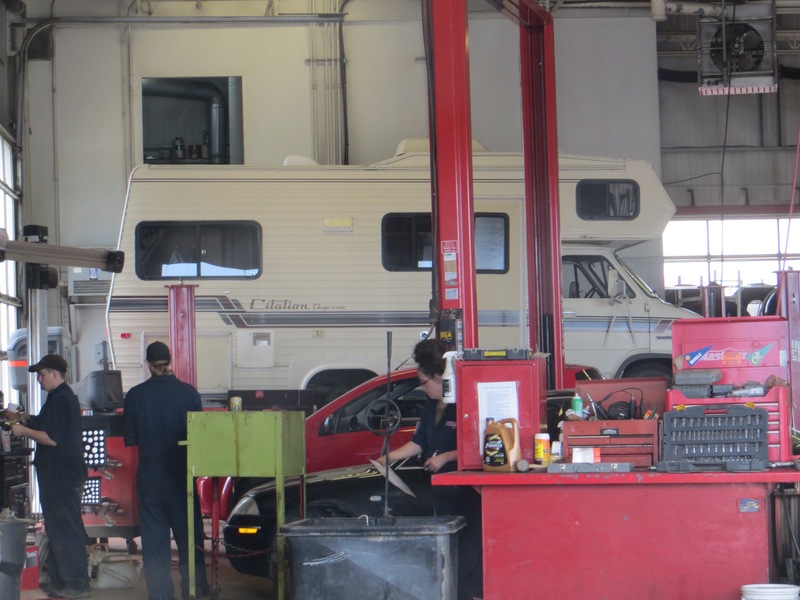 We , the BobbseyTwins, were so excited that Canadian Tire called to say that the Master Brake Cylinder had arrived from Edmonton, and the camper would be ready by noon. 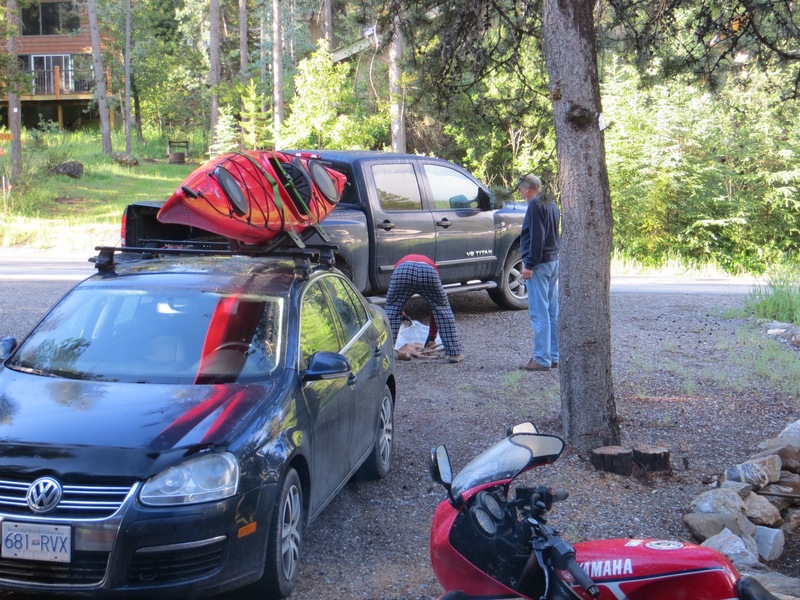 We were packed and ready and eager to motor. Of course, Miss Cranky Pants had her own plans. We arrived after 11am. and didn’t get out of there until 4p.m. She needed a new fan clutch, back brake work..blah blah blah. I lost it a little today. I couldn’t find my Pollyanna persona. No silver linings. Actually cried. I am really sick of spending time at garages! 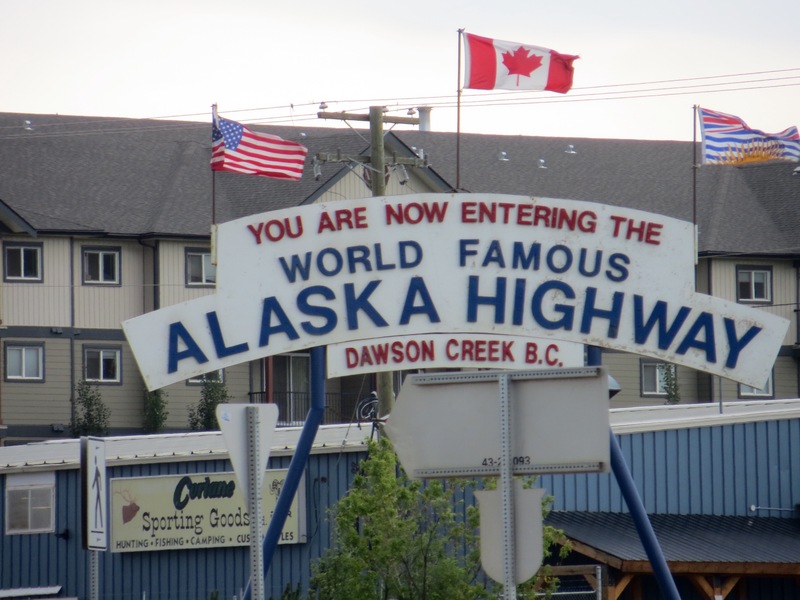 We are so close to getting to Alaska, but then are about 4-5 days behind on our initial plans. Where are the times for hikes and exploring? We need to put in long hours in the unairconditioned, fumy camper, to get to only some of our destinations. Alright then, I’ve fumed myself here long enough, and it doesn’t actually help. Back to Polly. But thanks for listening. 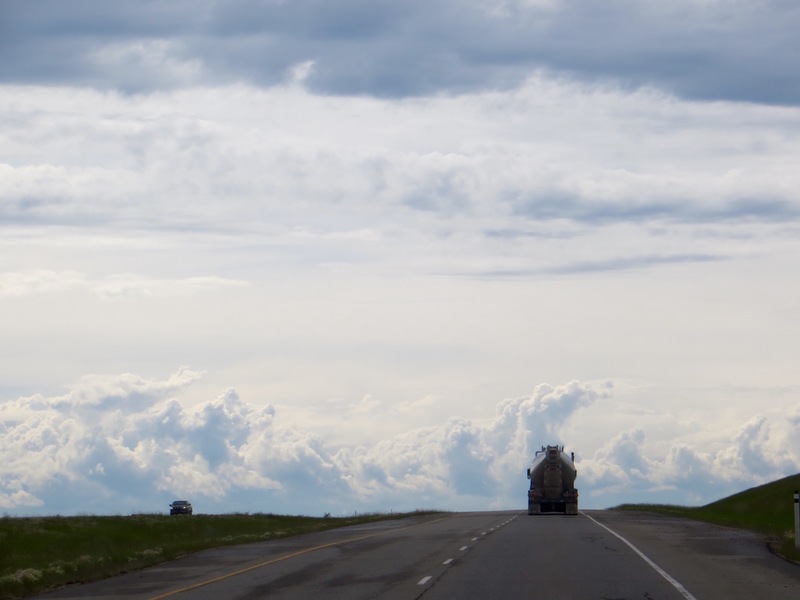 I felt so much better once we were out of Grande Prairie…the open road and big sky were invigorating. 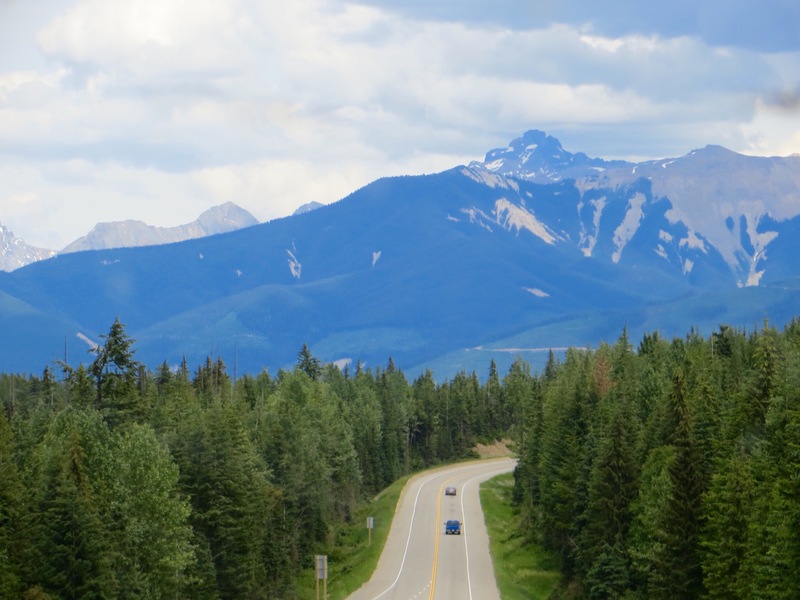 We crossed the Alberta, British Columbia border, and soon saw this…we were at Mile One of the Alaska Highway, which will take us through B.C. 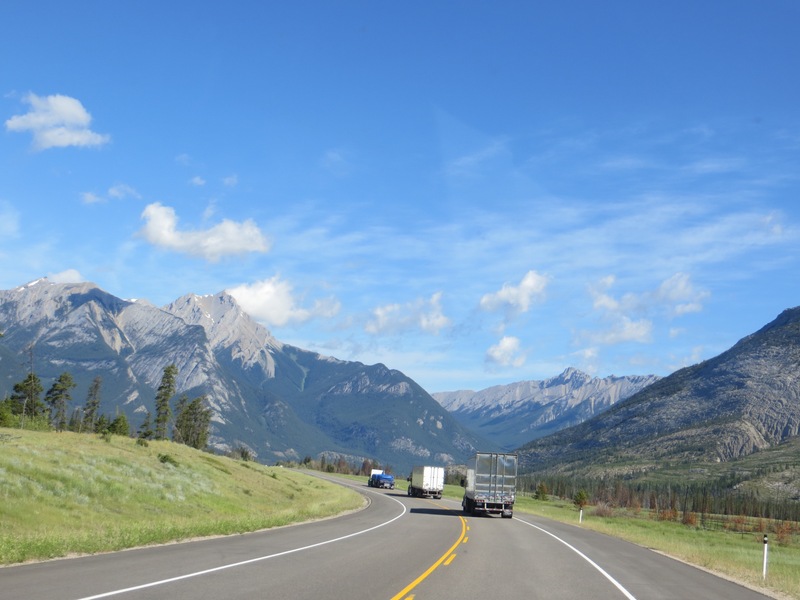 and Yukon before we get to Alaska…but the road has been begun. At Mile 30, (all the miles are marked,) we came to the South Taylor Hill…with a 10% grade decline..our steepest descent ever! 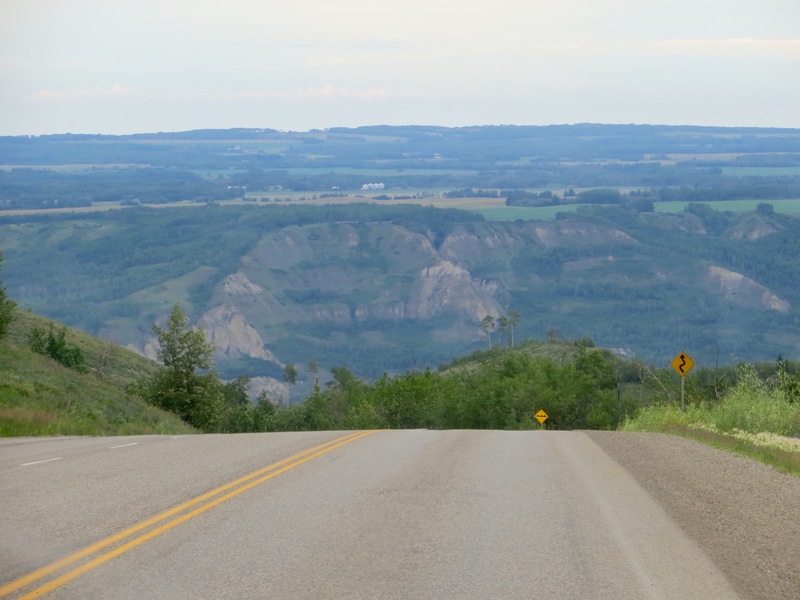 Once down, you can see the Peace River Bridge, the longest water span over the Alaska Highway, built in 1942 , replacing ferry service and changing the course of this famous highway. We arrived at 8 at Rosco’s RV Park in Taylor. 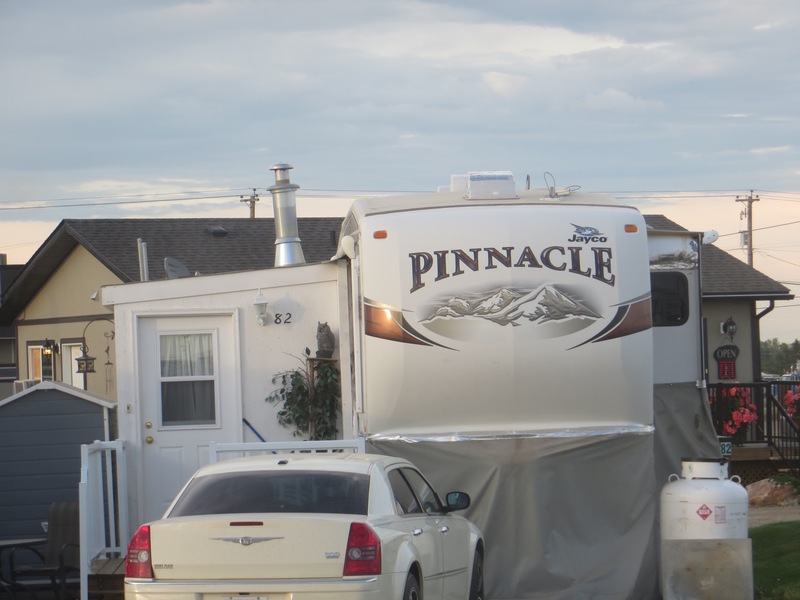 Offices at campsites tend to close at 8…This site was packed with trailers, cheek to jowl. The site owner told us that men and women working on the oil fields, all around here, make this their home away from home, and just leave for work in their cars. I thought this fellow was feeling very much at home. Another day, still the same place though. We’re getting to know Grande Prairie too well. We seem to be the only ones out on foot! 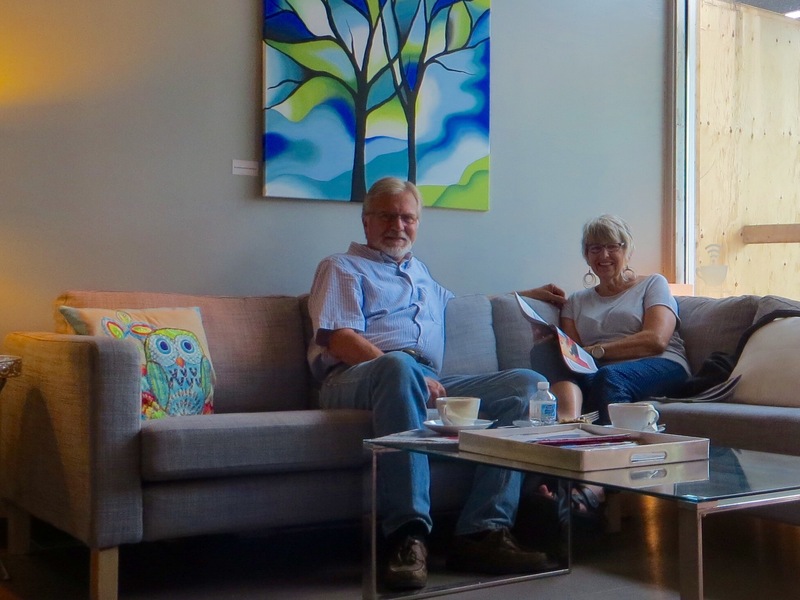 Here we’re taking a tea break in a cafe, where I loved the sectional couch and pillows. Also, big treat , the Saturday Globe and Mail which we found still for sale in a smoke shop. Now we can work on the crossword and the Sudoko…made our day. Later we walked to a mall to watch a matinee…not a good movie but it gave us a goal and a hike there and back. Tomorrow, we expect to be “on the road”. Trying to spend a day, without a car, in 37C! is a challenge. Frank opted for the Heritage Museum, for one thing. 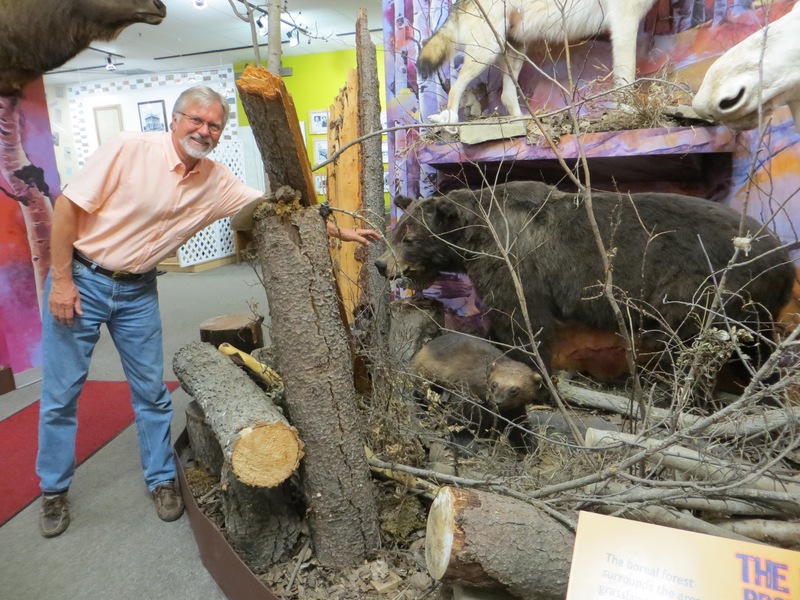 Part of Grande Prairie’s heritage is bears…Frank was very brave with this one. This city, as many of the places we’ve been to, has bear safe garbage cans throughout it. 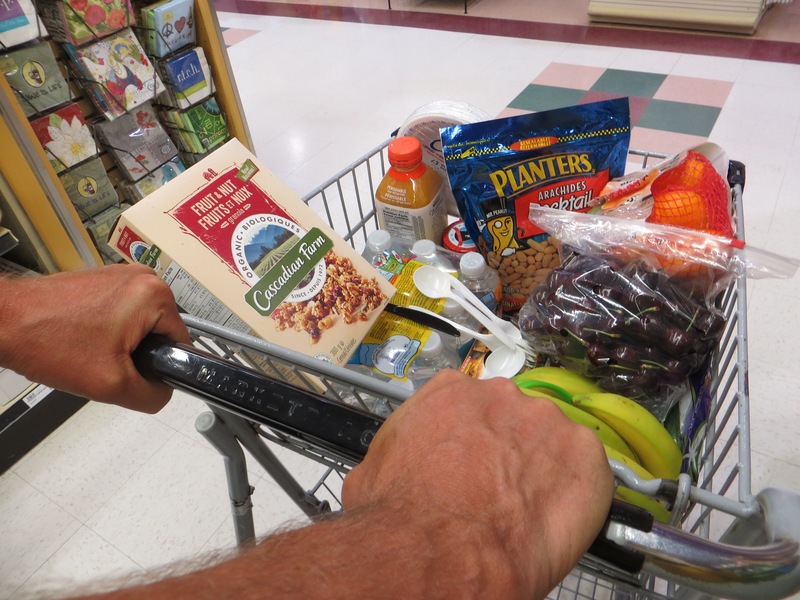 Weird to think that a bear would come into any of these peopled areas, for a snack. There is an expression we’ve heard..”a fed bear is a dead bear”…if a bear starts to come around for food, removing and relocating him will only postpone his return, hence the “dead” part. After the museum we melted our way over to the Art Gallery. 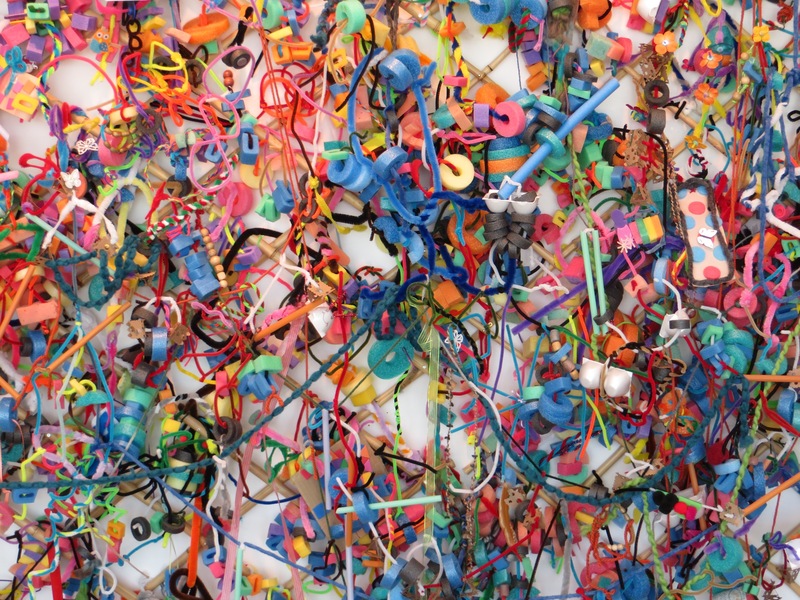 This is a section of a mural by kids….it’s so Jack Pollack. We also checked out the library, where our passion for bargain books was sated. Side Bar: as I am writing this, our hotel room, the entire hotel, is shaking, as the train goes through town! It did this yesterday too…how long can a building continuously go through this without incurring damage? We both thought “earthquake” except we heard the train and its whistle. Oh the things we have seen, and felt, in the last month! 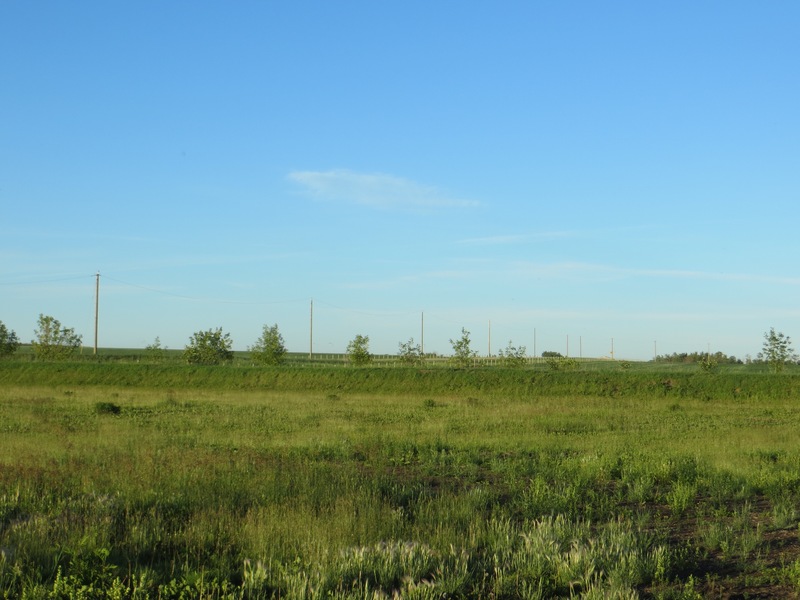 I forgot to mention why this city is named Grande Prairie. Yes. After all those mountains, it’s a shock. But the bigger shock, well, not really, we stayed awake at night worrying about it, is that Miss Daisy’s Master Brake Cylinder has a fracture, and needs to be replaced, and the “new from Larry fan clutch” seized, apparently defects happen in this product….so long story short, we had to leave our home on wheels in a garage and flee with a small bag each..until Tuesday!!! when a part can be delivered from Edmonton. 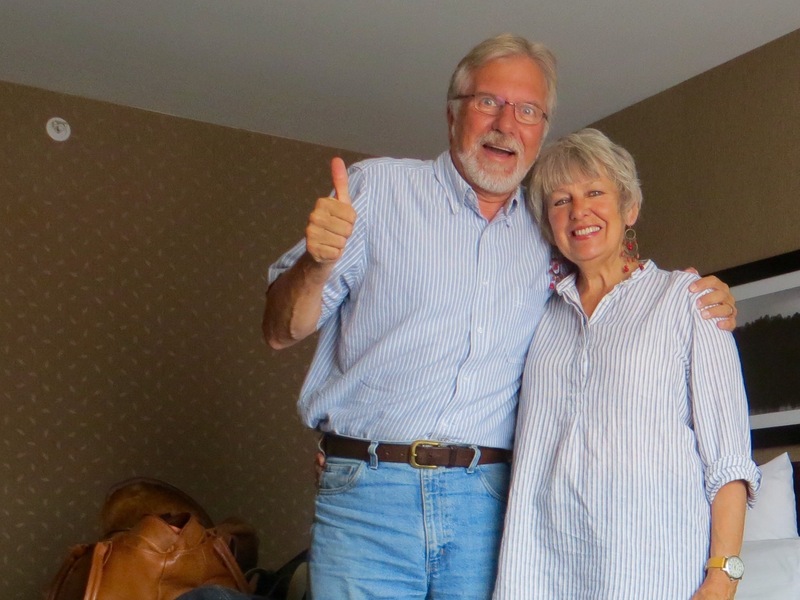 We had to walk, as we had already used a cab to get to a hotel…and man, it was 6p.m. but the sun was at the 1p.m. Mark in the sky! Hot, no shade…but I understand others have rain…so I’ll say no more. 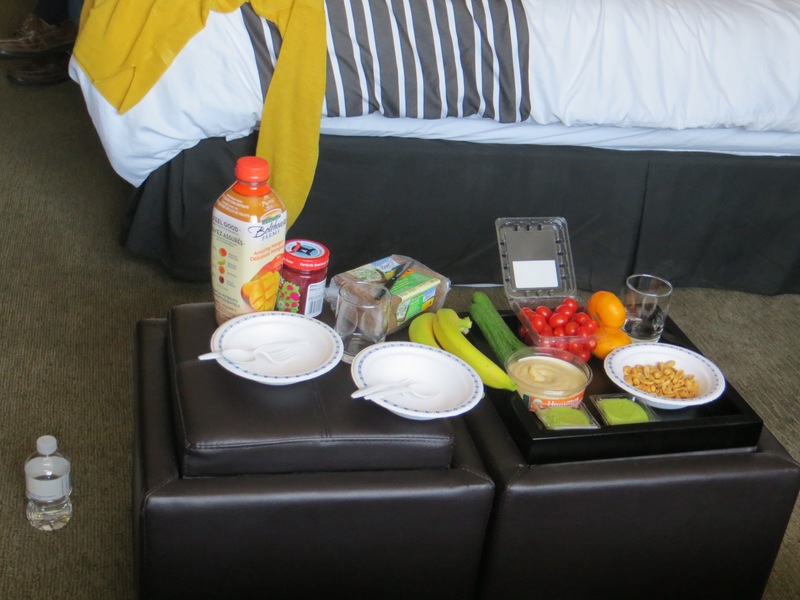 ..not quite ready for Canadian Homes and Gardens magazine, but my attempt at a colour coordinated food photo shoot. Really, we are soooo lucky that we had no accident! So we can smile. 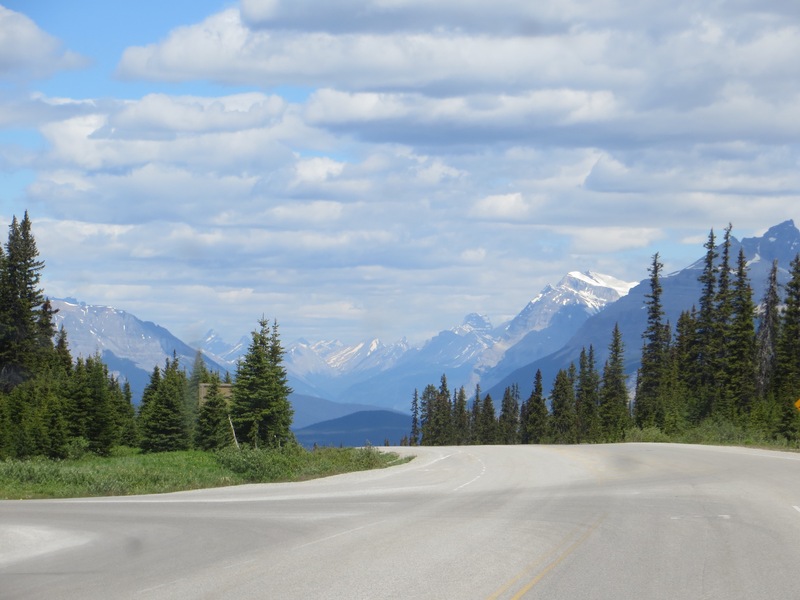 So I feel a little bad that I forgot to mention yesterday that the Icefields Parkway that started at Lake Louise and went to Jasper, 232 kl, is called one of the most scenic drives in the world! 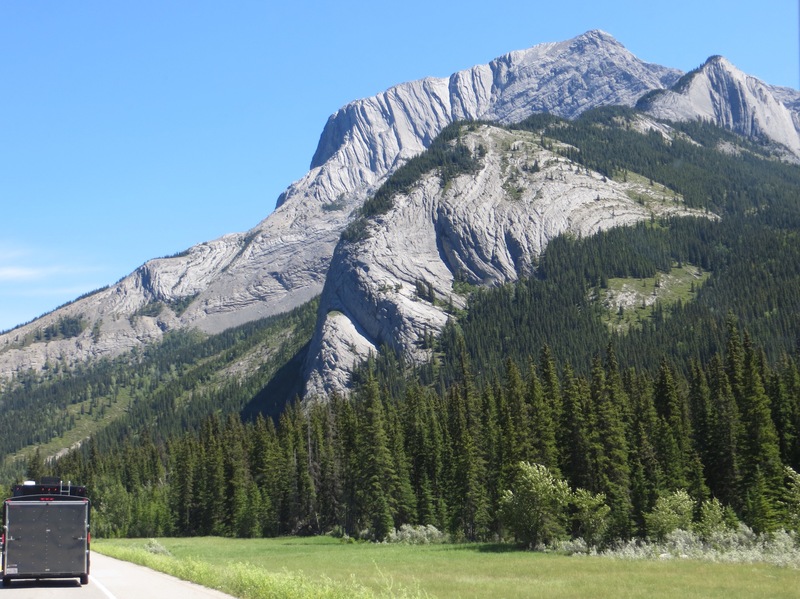 So here is the view just outside of Jasper..always changing. 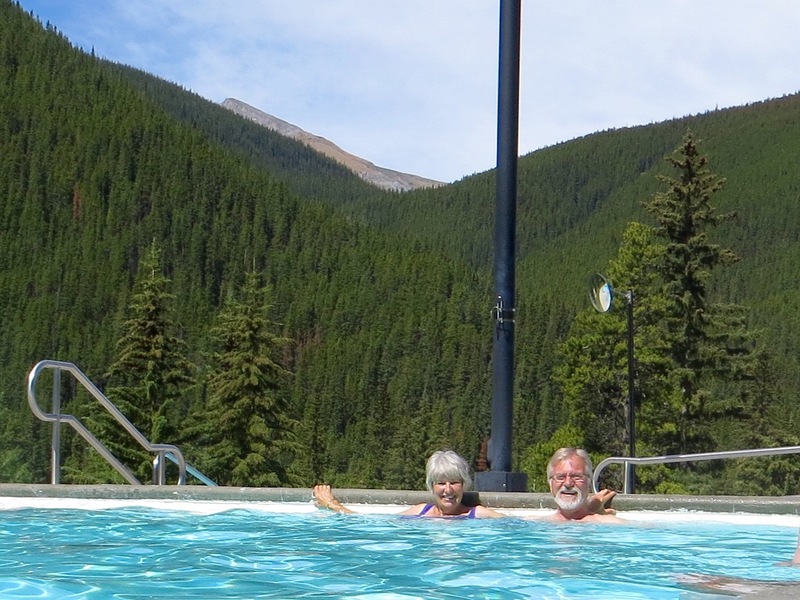 ..and here we are , a short distance North, in the Rockies at the Miette Hot Springs…um, that was nice! Made me think of my times with Finn in the hot tub, but minus his toys and my beer. Loved it. 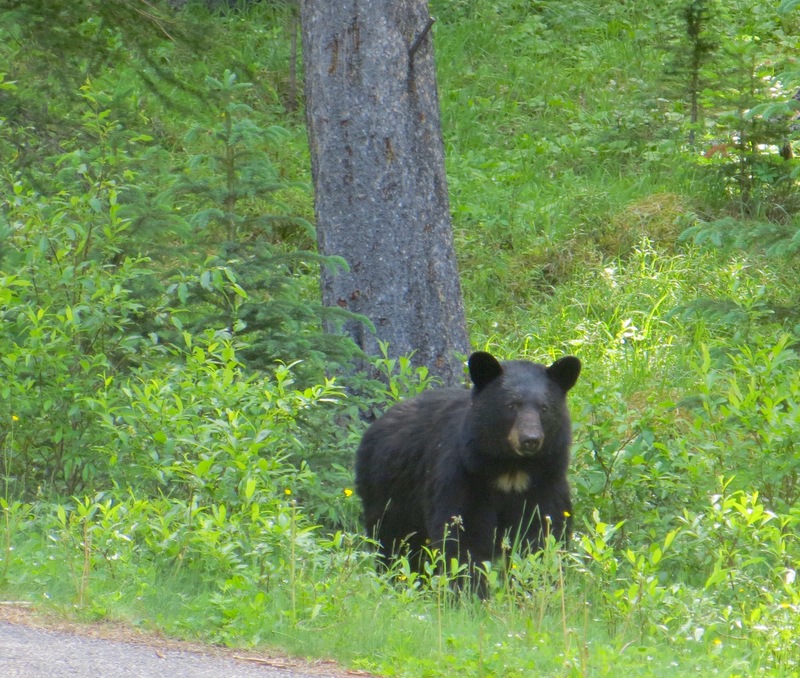 We were told we could do a quick 10 trail to the site of the source of the hot springs, but, look what we encountered along the way..
..a black bear! There was another couple walking behind us when we spotted this guy/ gal in the woods. We all stopped to get a photo, from a distance, as were told is alright..BUT the bear then started to come at us! The others started to retreat quickly..too fast as it might trigger pursuit, but I also made a guttural kind of growl and looked big (thank you UTube) and the bear stopped. The incident was reported, and all were told to stay back from this aggressive bear, as this was unusual behaviour. So everyone who had noticed our quick retreat from the trail, came a little closer for zoom lens photos. This was my simple camera…Frank took it as I was shaking too much. Though the bear looks sweet in the photo. 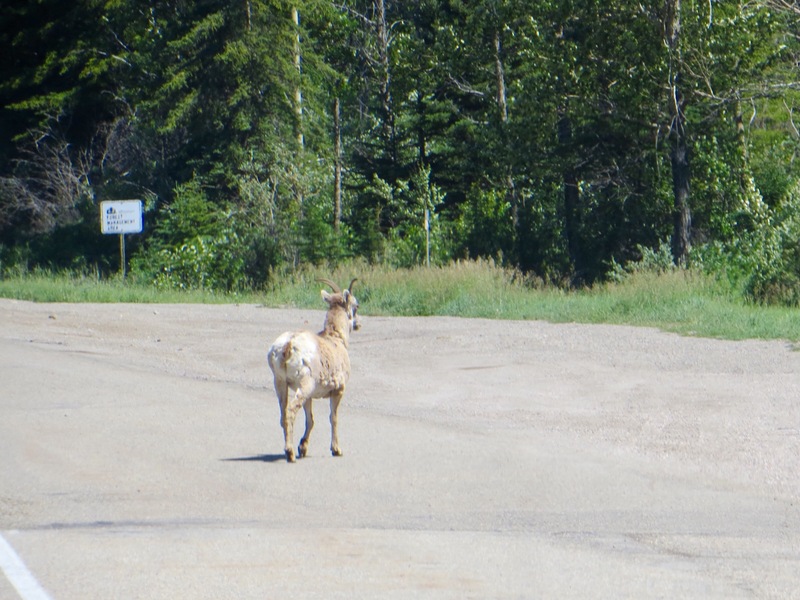 ..then on towards Grande Prairie, Alberta, past 360 million year old rock faces..
..though I missed the face of this Bighorn Sheep that crossed the highway in front of us..
..and now we sit, in Country Roads R.V. 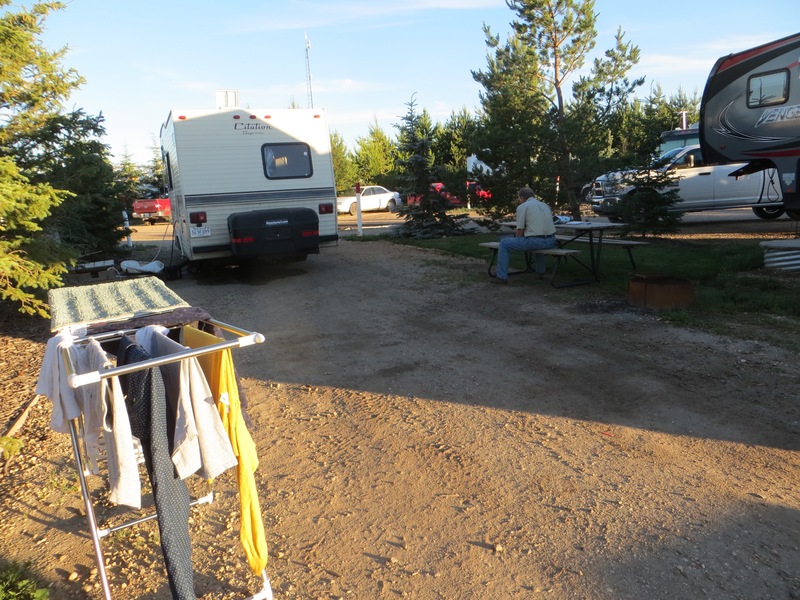 Park, just outside of Grande Prairie, with too many camper van woes to mention here. We had an “on site” service call, and may be spending some days, in this spot or at a service station. Unfortunately, it’s the weekend! Not too much can be done with parts shipped from yonder, etc. we haven’t eaten dinner yet, it’s 10:15 and the sun doesn’t set till close to midnight, but we are just a little too uptight to settle down. 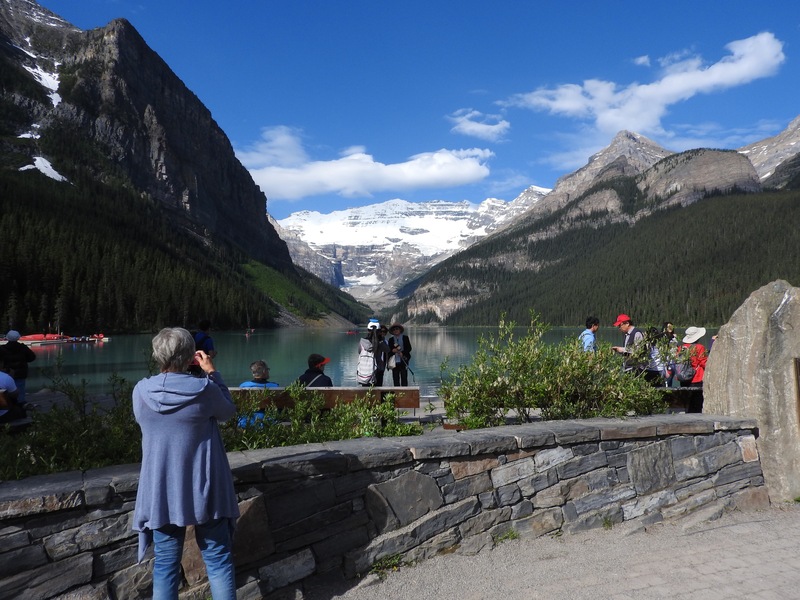 Checking out Lake Louise, in Alberta. 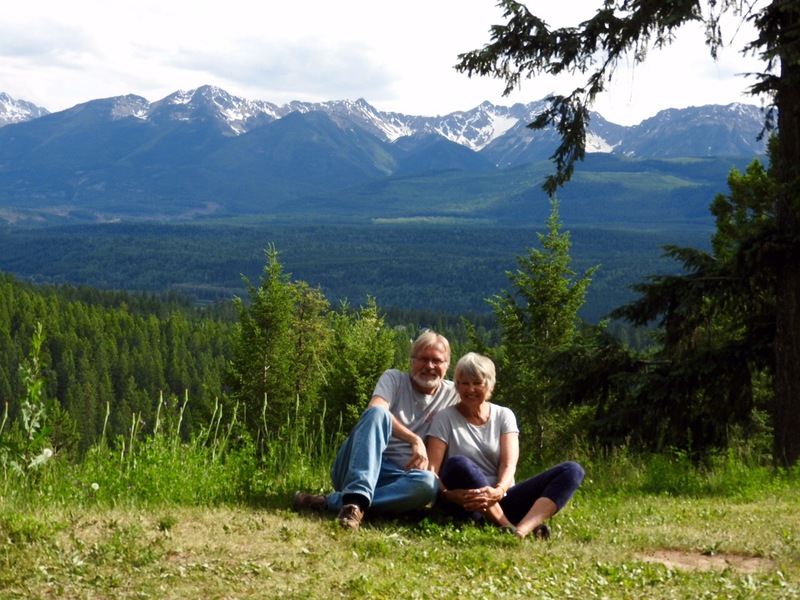 We had done a detour to see Karin, (our pleasure) so we left British Columbia to check out some other sights. 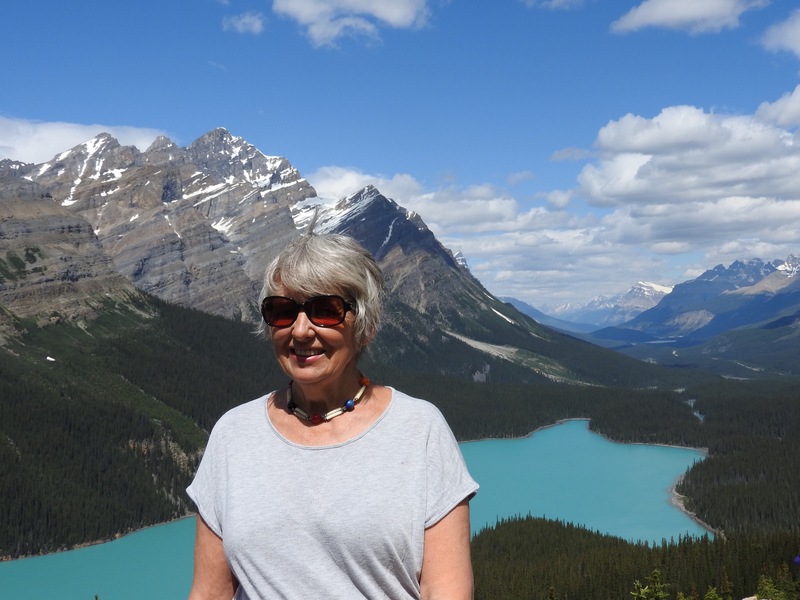 Me again, now in front of Lake Peyto in Jasper National Park. 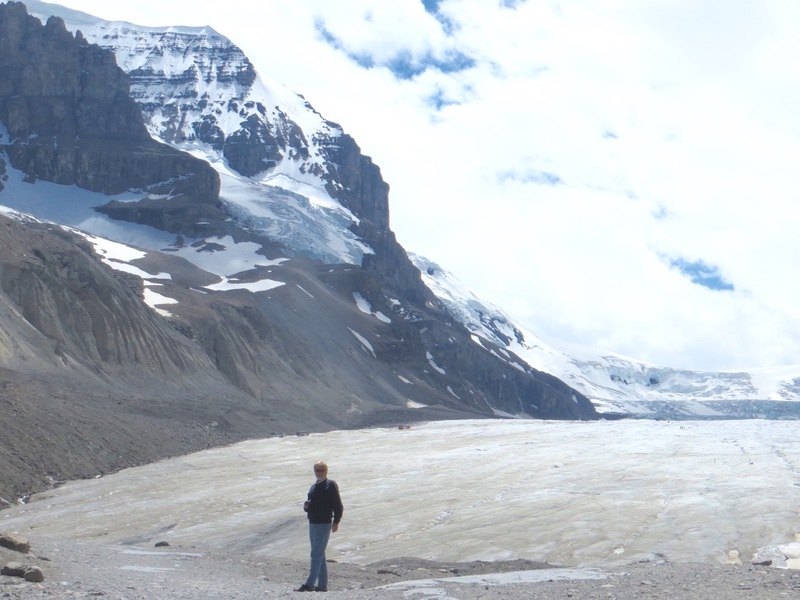 The mountains and the colour of the water are amazing..
Frank standing in front of the Athabasca Glacier on the Columbia Ice Fields within the park. Now this was awesome. 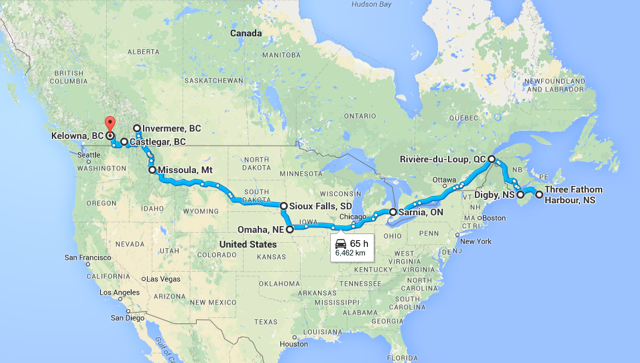 We started from Kelowna today, which is highlighted on the map…the map doesn’t show all the stops but gives you an idea of our journey . 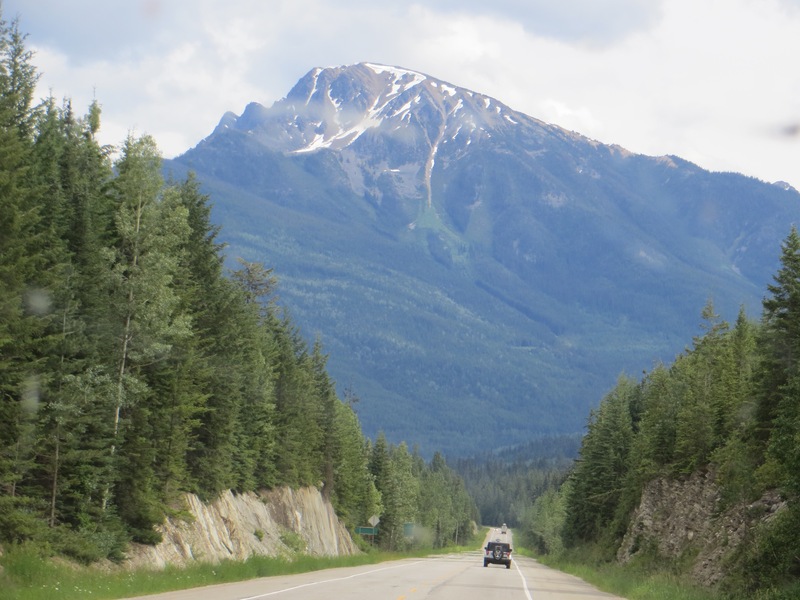 We travelled to Revelstoke for lunch, then drove through Roger’s Pass and on to Golden for the night. Such impressive mountains. Really, we felt as though we could touch the peaks of these mountains as we approached Golden. 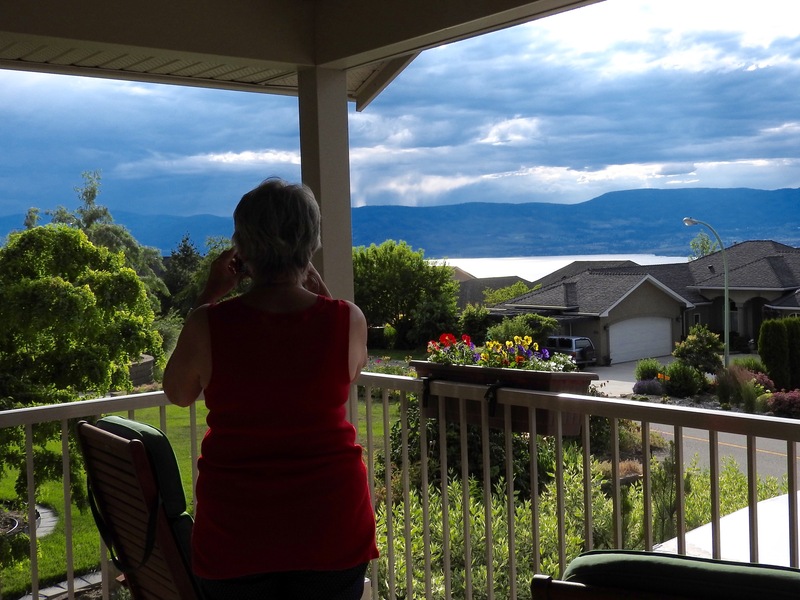 A full day in Kelowna, some of it spent enjoying a brunch with our niece and nephew on the deck outside…lovely. 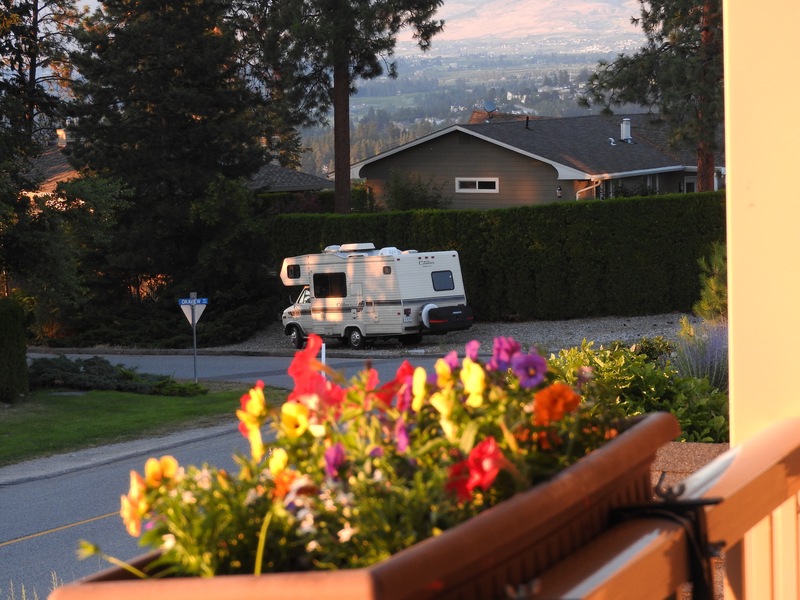 This is a view of the front garden from that deck. Frank and I were constantly saying that this area, and what we drove through yesterday, reminded us of Burbank (L.A.)..as it’s surrounded by a mountain range, is very desert like, yet then there is all the lush vegetation where the land is irrigated, and also, that it’s so beautiful. 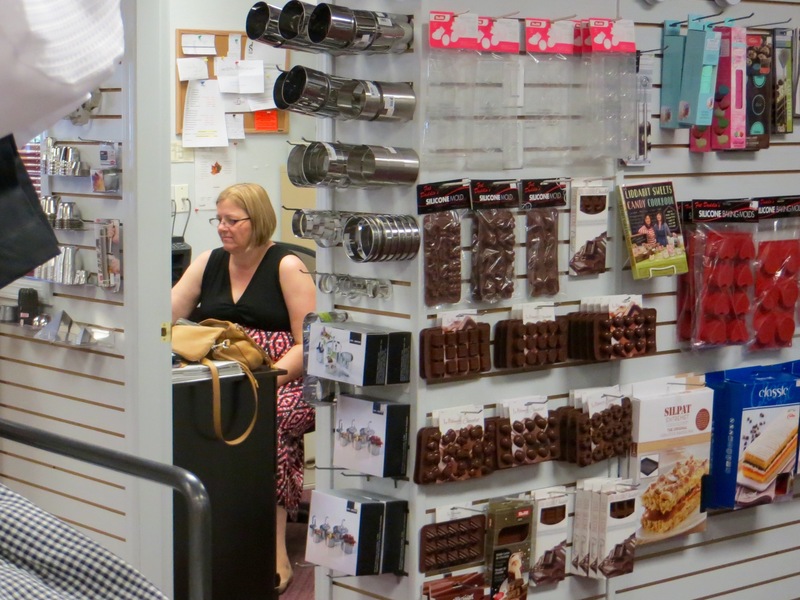 We visited Karin’s business..The Chef’s Edge.. A huge fully stocked kitchen essentials store. 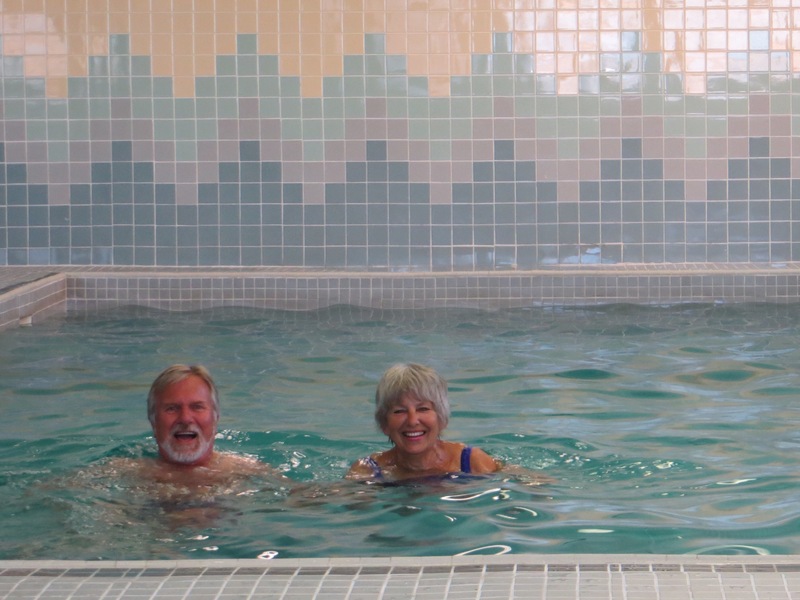 Karin’s staff told us what a wonderful boss she is to work for, but of course she would be! And meanwhile, Miss Daisy had a good day..with another service call, this one in the parking lot of a Walmart, where a mobile R.V. Serviceman came to see her. Her refrigerator had stopped functioning a few days back, but she was set right…and here she is, taking the rest of the day off, hanging out across the street out of harm’s way. 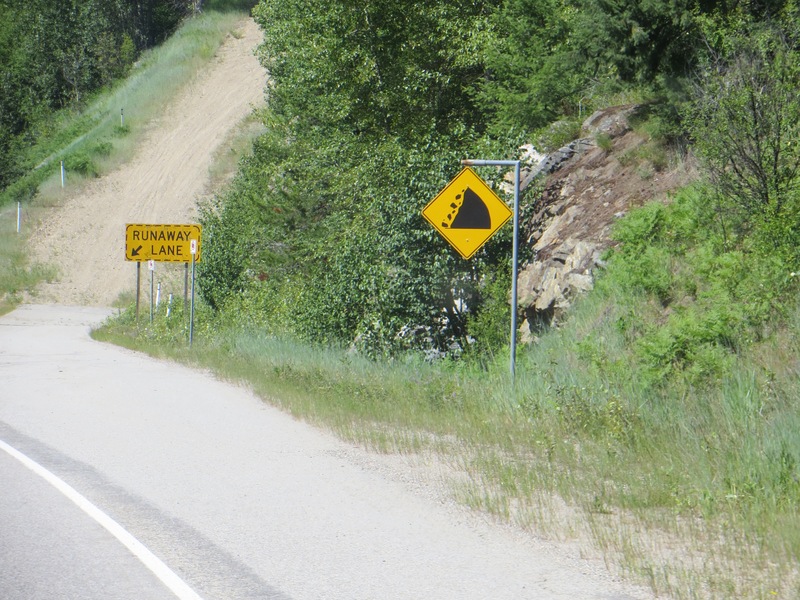 Driving in the Rockies again..towards Kelowna, B.C…this sign was true to its word …it was steep for soooo long. ..and then there’s this sign. 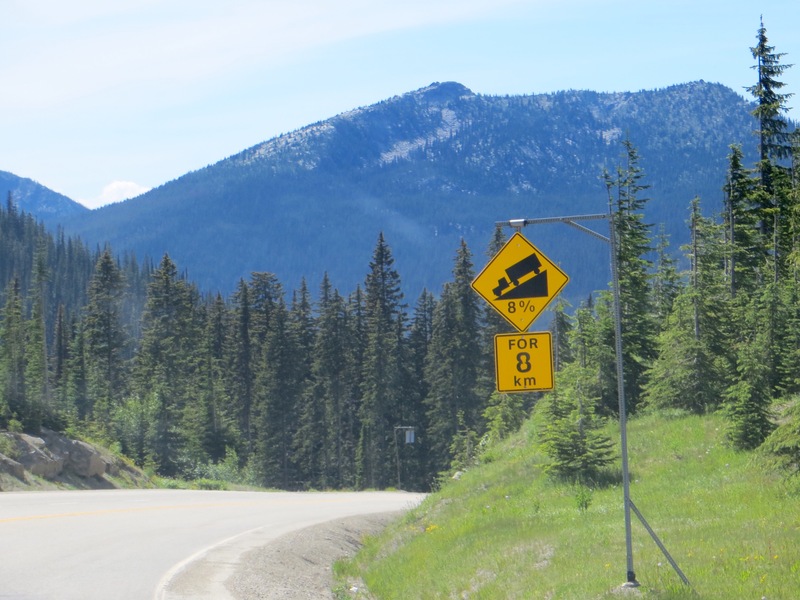 First, to remind you that trucks lose their brakes and need to be driven straight up these ramps, when the drivers find them, and you hope they aren’t behind you when the drivers realize they have a problem…and what about the falling rock? Is knowing it’s a possibility actually helpful? Does slowing down make it any less painful when the rock hits your car? 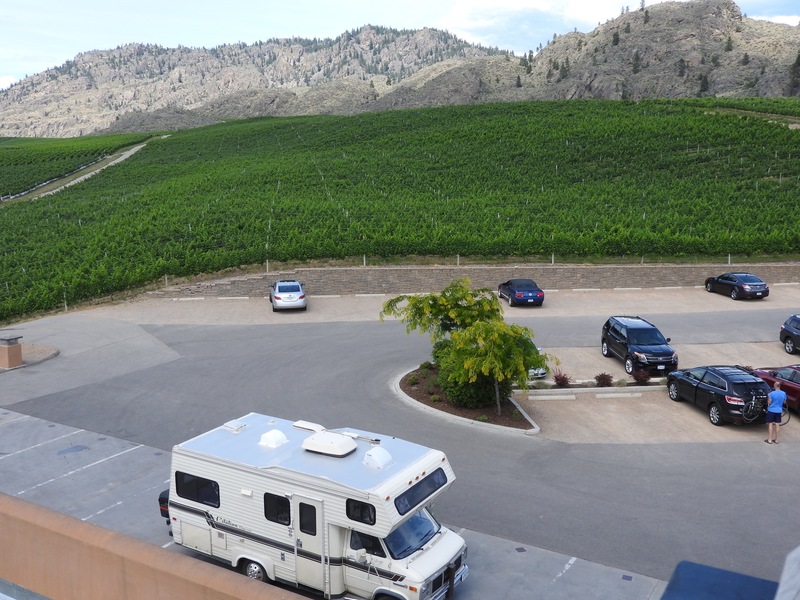 And so we drove, and drove..
“Miss Daisy” is feeling really smug here, in the lot of a winery in Osoyoos, B.C., where the scenery was lovely, as is Osoyoos, the warmest spot in Canada to live in , in case you want to move. We did. At Karin’s, Frank’s sister, (and one of my sisters! The “in-law” is so generously left out. ) 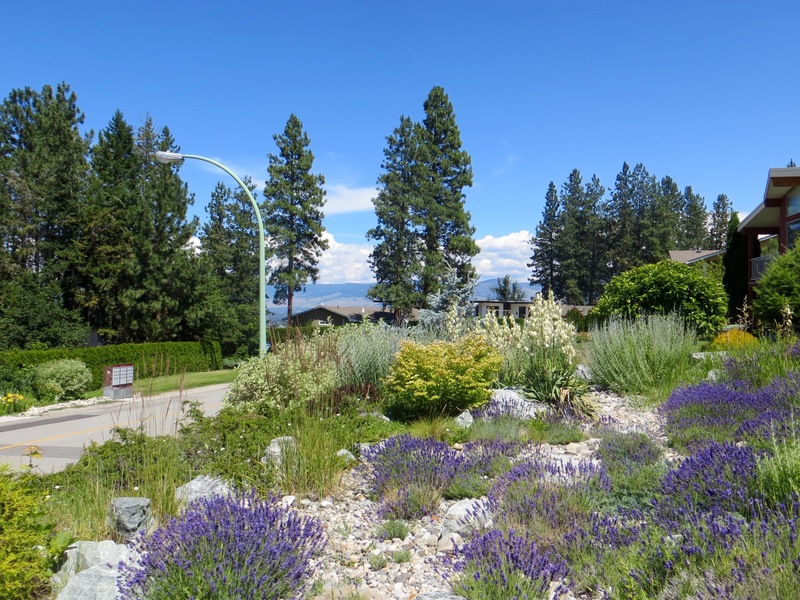 This is on her deck in her lovely home in Kelowna. It burnt down completely once as a casualty of a large forest fire, but was rebuilt and loved once again. 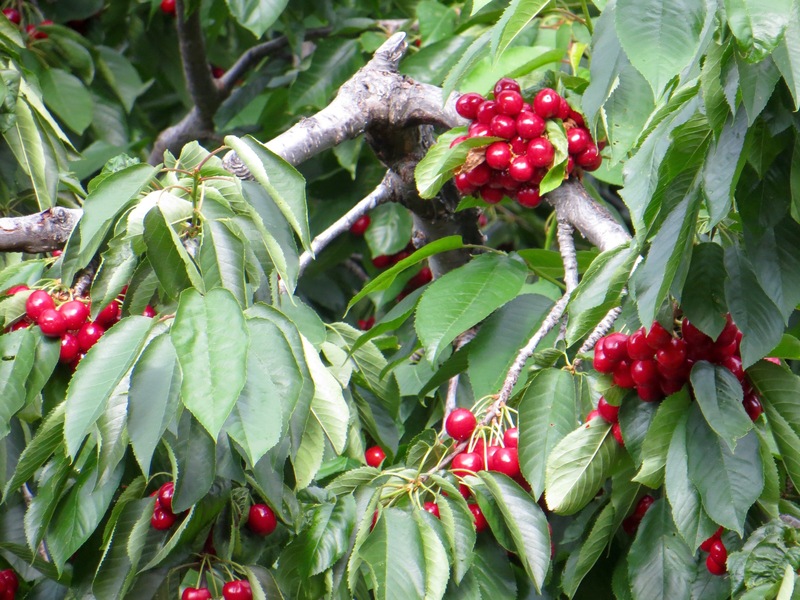 The cherry tree survived the fire, and is so plentifully endowed with fruit, that Karin and her family have agreed to share with the birds. A win- win situation. 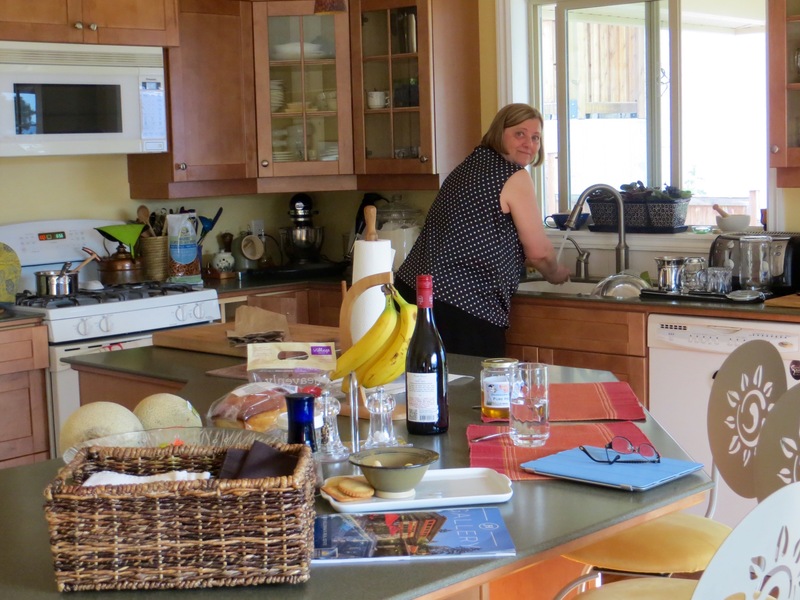 Karin working on a home cooked meal for us…always a treat! And being in “real” homes feels like such a luxury..a huge amount of space! Actually, it sort of messes with your mind a little. Adventure of a natural order today at Kathy and Andrew’s. 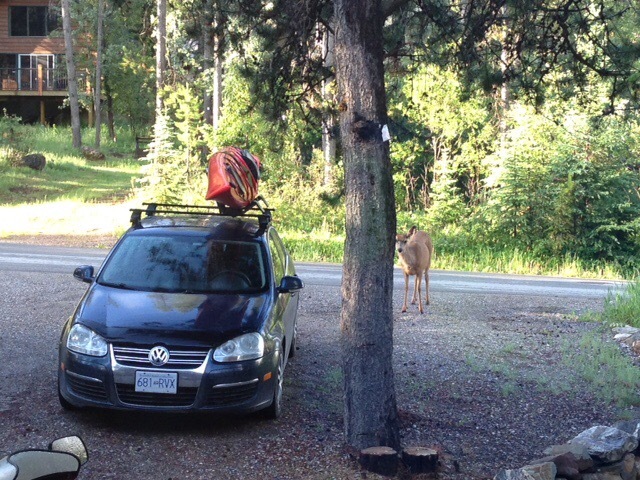 There was a mule deer, a doe, in their driveway, and its fawn was dead and partly hidden under Kathy’s car. Andrew went out to move the car forward, once the doe had retreated. As he was driving forward, he sensed something amiss. 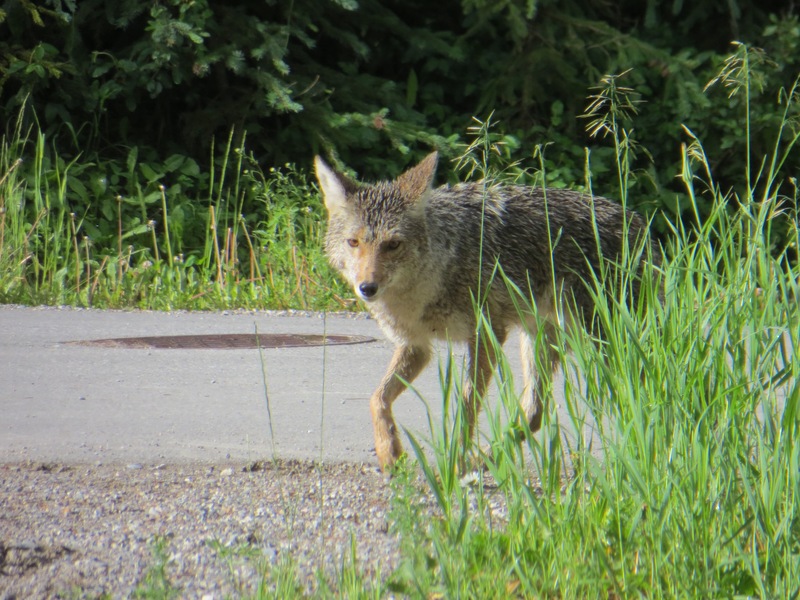 When he stepped out, a coyote ran out from under the car and up the road. It had been there all that time, pulling on that carcass! 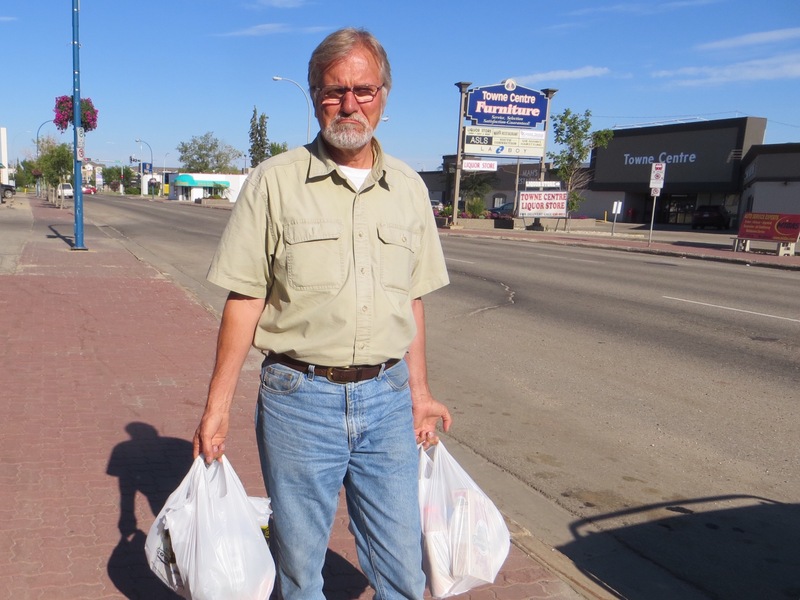 Andrew drove his truck near to the fawn, put it in plastic and onto his truck, and left to dispose of it. The doe watched it all from across the road. Once Andrew drove away, the coyote came back, but, finding nothing, soon left. 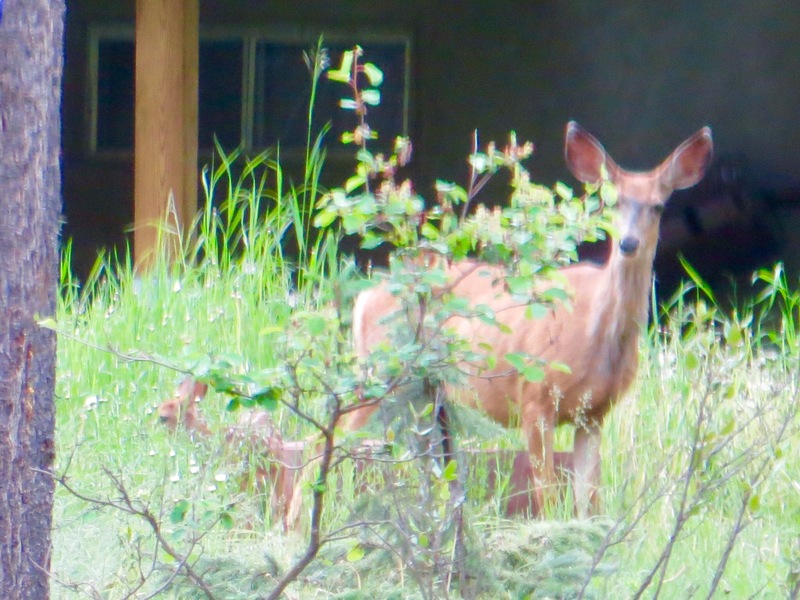 ..and when it did, the doe across the road, reappeared, with another fawn. That really made our day! 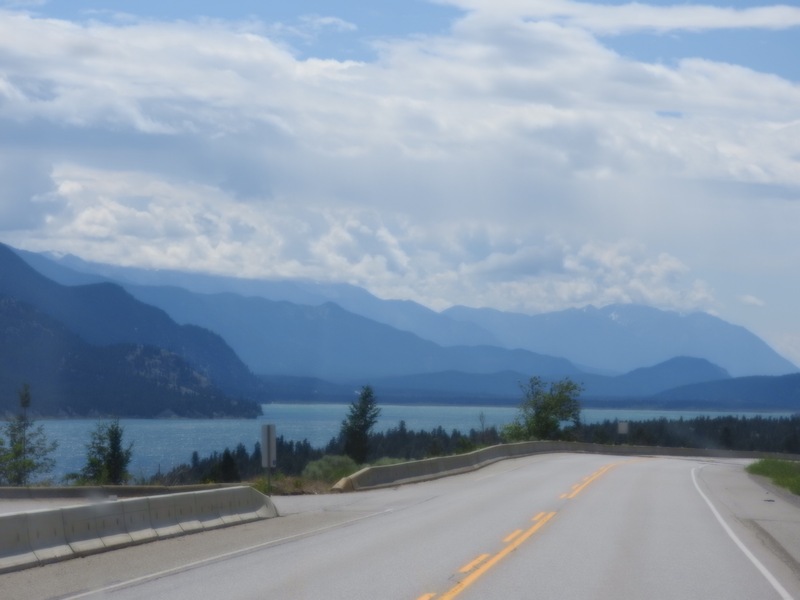 .a day that included an exhilarating walk on a trail by the Panorama ski lodge, along a roiling river, and then saw us on our way, driving high into mountains and low into valleys, until we arrived for the night at Castlegar, B.C. It is so beautiful to go from the snow peaks to cherry orchards in the valleys. I’m telling you, just watching it all go by, from my passenger seat, is exhausting. You are staring the entire time…but I’m not complaining, just filled with all the images.